This appalling tally, in that twelve months alone. Loaded up with tin fish waiting there to shoot. Rescue none – leave none afloat – the ghastly message sent. Launching their torpedoes in day and night routine. Contending with the enemy and awesome hurricanes. With stubborn sense of purpose they carried on their trade. Long range Liberators with radar newly built. Seamen helped to bring it, many years ago. 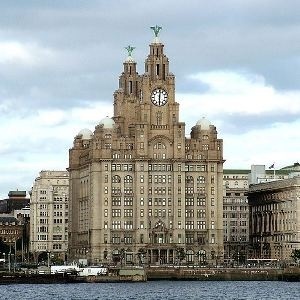 The Liver Building from the River Mersey. All vessels have a life and time - with natural will and ways. Rolling and a`pitching when steaming through the waves. They’ll speak of ships on danger trips that helped them to survive. 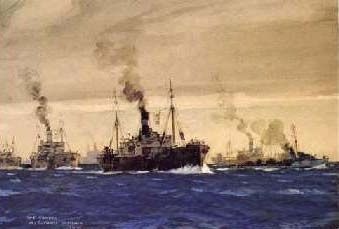 Of liners and the escorts, the tankers and the tramps. Flying our Red Duster where ever duty called. They saved our land when needed, in dire and desperate times. But like the men that manned `em, bless `em all with pride. 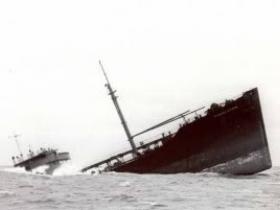 Countless ships throughout the years sunk or made a wreck. Kon Tiki rafts and whalers and fancy motor boats. No use now to anyone, static in the dark. And many rusty anchors from craft that had to slip. Barnacles encrusting on iron there below. Endeavour now to keep afloat – on Neptune’s fickle sea. Pitching heavy in head seas, into the spray and the cold. Just as her bow descended, headlong into the swell. Quickly led to foundering, when water took its place. Only four abandoned her - as the ship went down. 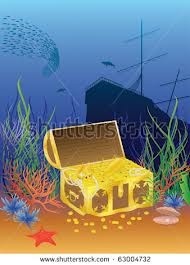 Thirty three men within her, bound to deep sea graves. Is for the likes of these men, who died here that September. 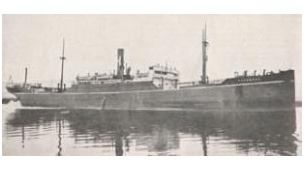 The Tregenna sailed from Halifax in convoy HX71 on 5th. 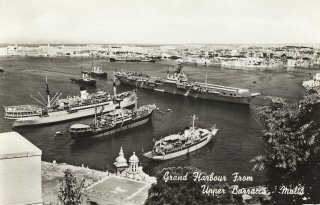 September 1940. This catastrophe was observed by men of the Filleigh who were in station less than two minutes travelling time directly astern of Tregenna. According to the 2nd. Mate, she had sunk in less than forty seconds. Engineers tried everything but toiled and fought in vain. Westward to Mauritius - two thousand miles to go. Plus cigarettes with matches and baccy in a tin. Along with hard ship’s biscuits carefully dispensed. Carried then ashore - for they could not walk at all. And wore it in the lifeboat clutched around his chest. Brave to save the colours, before his ship went down. Not only is it bunting signalled from the yard. That’s why it went with Arthur in his boat as well. You will not stop – too much at stake. Torpedo`s target – lost at sea. Remember me – give us a thought. Farewell mates – now I`m dead. And the wolf packs frenzied feast. Our ship, I ponder, my turn next? But will the U-boats strike anew? Or be lost for ever more? Or in the hold with a massive boom?. Grieving for her youngest son. To blazing water round my neck? Or if I’m injured - will I float? Must I die in the mighty ocean? Perished here - survivors - few. We’ll sail again - outward bound. While gently rolling `cross the deep? Often I thought it was lucky - so I went there now and again. Where the waiters called Chris Mrs, and sometimes called me Sir. So when we’re quietly bathing the noisy planes descend. For when the flaming jets come in the peace is really shattered. Down comes another Trident screaming through the air. A mighty jet flies over and we can’t hear what we say. You will see the underbellies of planes from miles around. And often come from Poland and some of them are Norsk. Parents and the young kids who also brought their Gran. Perhaps they’ll see what we did - dolphins here at play. And so enjoyed the respite - we never will complain. For soon we’re going to need one - just to get us home. Just the same around the world however long the trip. Familiar life of ships routine as she steams from A to B. Wing tips hardly moving `till they see their breakfast splash. All these things and many more, I recall just now. Dangling from its lizard, a waiting bosun`s chair. And constant turning on the spot - the modern radar scanner. Showing young apprentices the Ozzy locking splice. A growing tan while heading south and beards among the ranks. Telling yarns of wartime days and calling cook a runt. His authority is silent unless there are the grounds. Peril, fog or tempest will surely come one day. How I loved those salad days - I `spect that you did too. I was not born ‘till 41-I wasn’t at the fore, but later on I sailed with men-they told me what they saw. There never was a ‘phoney war’ for the merchant-men at sea. Especially in the early years-with two men lost from three. Sitting ducks for E-boats and explosives in ‘bomb alley’. An easy moving target, from engine room to galley. They were blown from burning ships-torpedoed by the Hun. Or victims of atrocity-shot by a Nippon gun. Plenty perished in lifeboats, many gave the sharks a feast. Still pretty much defenceless, the ships rolled West and East. They sailed North in Russian convoys-braved the ice and foe. Lived in hell conditions-and pitching, blind in snow. Some sailed independent-they steamed South on their own. Perchance to meet the U-boat-lurking ‘neath the foam. 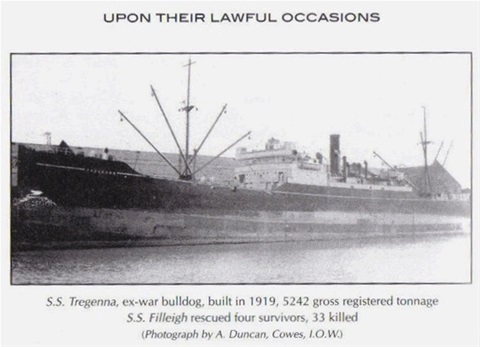 Many thousand seamen died-risking life at sea. It was the brave survivor who told me their history. The lethal mines would sink them, or the tinfish named by some. Or possibly a Junkers on a mortal bombing run. Crews foundered in the ocean-black or freezing cold. With mangled steel beneath them and pig-iron in the hold. But if they shunned the enemy, and escaped the heaving slaughter, well they just signed on again, and went back to the water. To the lads that never made it home-to all the men that died, wouldn’t it be apt to say “They never made the tide”? Over forty years I’ve toiled at sea- aboard all types of craft. But I doff my cap to those young souls that went and joined a raft. I’m mighty proud to march for them, on the 11th of November. For this very special breed of men that I for one remember. I haven’t any medals-but I wear my badge with pride. As the bugle sounds the ‘last post’ for the men who missed the tide. 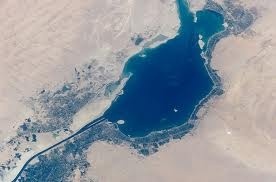 The `Bitter Lakes` from a Satellite. Picked the teams for soccer - playing on the decks. Were there to join the residents at the laying of a plaque. Unveiled our marble tribute between the trumpet calls. I saw the backbones stiffen as emotions took a hold. It seemed that nature joined us with thunder in the air. The President de Marco, told of his siege at home. Learning that the food they ate, sprung from men’s ordeal. But seek thy love when all else fails. Then we pray to see the light. To facing death in endless seas. Please guide us Lord, across the bar. Resting still across the deep? Have our garlands sailed astray? 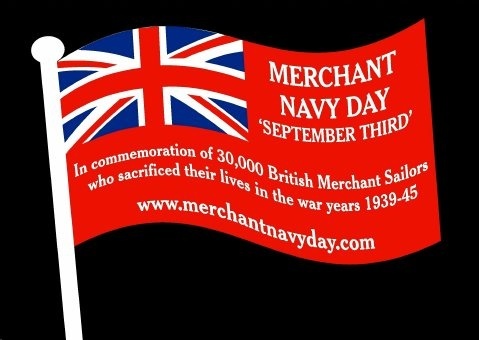 No, not on merchant navy day! Let’s celebrate the life they led - a voyage home now run. Upholding debt of gratitude boding no one ill.
“Welcome Shellback, come aboard - your friends are left to pray“. By bringing legislation to deadly `coffin-ships`. Eventually this Bristol man, won and had his way. Though well insured the cargoes of ships that broke asunder. Refusing work on rotten ships – ending up in jail. Urging for improvements and making them the law. Assisting in the buoyancy measured fore and aft. When life was even harder upon our blue seaways.